Home Guard Fireman and Driver Jobs. These vacancies are only for the 7 districts of Krishna, Guntur, East Godavari, West Godavari, Visakhapatnam, Vizianagaram, and YSR Kadapa. For all the AP Fire Services Dept Home Guard Fireman, Driver Posts only Male candidates are eligible to apply. Online application is activated on 28-01-2019 at http://202.83.28.165/recruit. 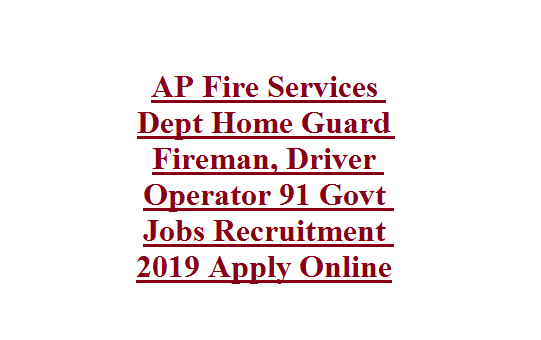 Last date to online form submission for this AP Fire Services Dept Home Guard Fireman jobs is 18-02-2019. Minimum qualification is 7th pass and 5 years experience is required to apply online for this AP Fire Services Home Guard Fireman Posts. 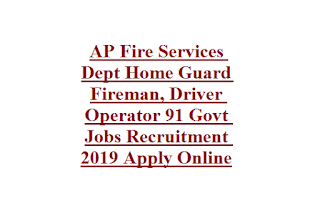 There are 73 Home Guard Fireman and 13 Driver Operator posts in this AP Disaster & Fire Services Dept recruitment 2019. Upper age limit is 50 years for this Home Guard recruitment of AP Disaster & Fire Services Dept. Minimum Height is 160 cms. For both posts 7th passed candidates are eligible to apply. For Fireman Posts: 5 years experience in relevant field is required. For Driver Posts 2 years valid Heavy Motor Vehicle license is required to apply. Minimum qualifying marks are 15. Candidate must have qualified minimum 3 tests from the below given 5 tests. i). Water Tender Drill - (10) – Marks. ii). Fire Extinguishers Operations - (10) – Marks. iii). Knots & Lines - (10) – Marks. v). Identification of Fire Fighting Equipment & their Use - (10) – marks. Driving test will be conducted for Home Guard Driver Posts. Candidates who is having experience and interested to work as a Home Guard they can apply online for this Home Guard Driver and Home Guard Fireman Jobs before the last date of 18-02-2019.